TIME TO GO HOME - From England to New Zealand the long way. 10,000km overland by skateboard, 4,000 miles over the sea by boat. So what started as a 12,000km cycle journey across the Eurasian continent has now become a very different kind of challenge. Traveler Rob Thomson has cycled 12,000km from Japan to Switzerland across some of the most remote and hostile environments on the planet. He has endured -23 degrees Celcuis daytime temperatures, cycled over 4,600m high passes, and has put up with some of the most challenging bureaucracies on the continent. 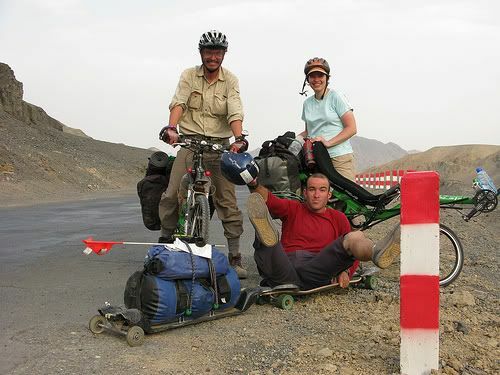 However, on the 25th of June 2007, almost a year since he set out from Japan on his recumbent bicycle, he sent his bicycle home and started out again on a longboard skateboard. He is doing what has never been attempted before; skateboarding solo and unassisted across Europe, North America, and China. Having already skated 1,500km through Europe from Switzerland to England, he is now ready to skateboard 5,000km across North America, and follow up with a 5,000km warm-down across China before flying home to New Zealand. Wow! I used to skateboard when I was a teenager (broke my arm doing 180s in the garage...hehe). This just amazes me. That's determination there. :) Crazy.